Over-the-horizon radar systems are capable of localizing targets in range and azimuth but are unable to achieve reliable altitude estimation. Past work has shown that the time-varying Doppler signatures of micro-multipath signals provide rich information for reliable estimation of altitude changes. In this paper, we develop a new technique for the estimation of instantaneous altitude of maneuvering targets by exploiting the estimated multicomponent Doppler signatures. 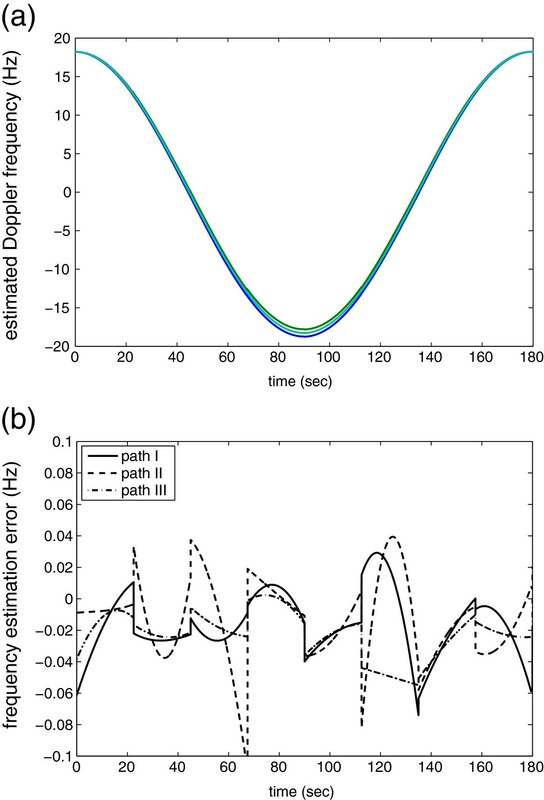 A key contribution of this paper is to apply effective non-stationary signal analysis techniques for estimating the time-varying Doppler signature of each individual multipath. This enables reliable target altitude estimation in an extended Kalman filter setup. The maximum a-posteriori criterion is used for the estimation of initial target states. High-frequency (HF) over-the-horizon radar (OTHR) systems that exploit skywave propagation, i.e., reflection and refraction of radar signals from the ionosphere, provide wide area surveillance capabilities to detect and track targets at farther range (thousands of kilometers) [1, 2]. The capability of OTHR systems to cover a surveillance area beyond the range of conventional line-of-sight radars makes them uniquely important in a number of applications. In OTHR operations, narrowband signals are used because the available signal bandwidth is constrained by the prevalent ionospheric conditions and the range extents. As such, the range resolution of an OTHR system is typically measured in tens of kilometers . Traditional OTHR systems use a two-band linear array for transmit and a very long array on receive, which provide large apertures for high azimuth resolution. Recent developments in OTHR systems suggest the use of two-dimensional (2-D) transmit and receive array configurations, combined with advanced signal processing techniques, such as multiple-input multiple-output (MIMO) radar approaches, to effectively mitigate noise and spread-Doppler clutter sensitivity problems . 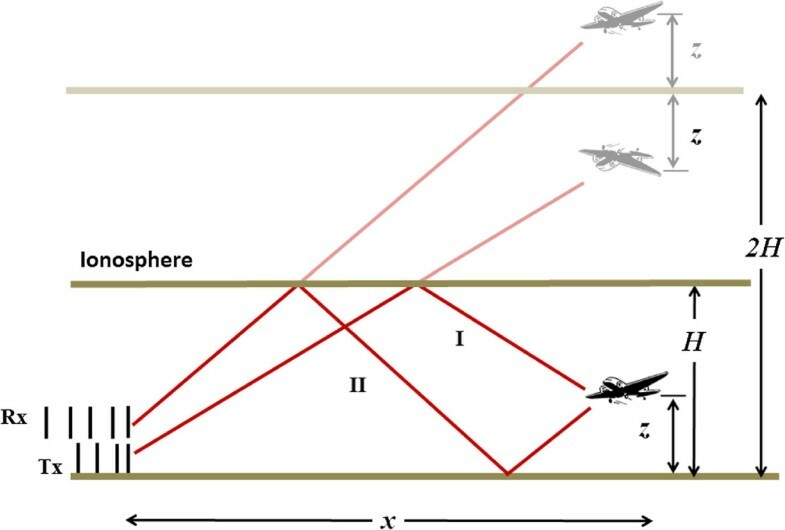 In these configurations, the aperture in the range direction provides observation and processing in the elevation dimension to support target altitude tracking. The limitations in signal bandwidth and array aperture, as well as the low signal-to-noise ratio (SNR) make it difficult for an OTHR system to provide good range and cross-range resolutions. Because radar signals are reflected by multiple ionospheric layers, a number of techniques have been developed over the years to exploit the rich multipath propagation associated with moving targets to improve the target localization and tracking performance [4–6]. Multipath exploitation radar is also found in other applications, such as through-the-wall and urban terrain sensing [7, 8]. Practically, the range and azimuth resolutions may not necessarily require a very high resolution. This is not the case for target altitude. Target altitude provides important information for the determination of the type and flying course of a target. For this information to be useful, an accuracy of a few kilometers or less, rather than in the order of tens of kilometers, would be desirable. Toward this end, effective techniques based on micro-multipath model can be devised to provide accurate altitude information. These models make use of multipath returns due to ocean or ground reflections that are local to the target . The micro-multipath propagation is illustrated in Figure 1. In essence, instead of using multipath propagation through different ionospheric layers, the micro-multipath propagation model focuses on the relatively stable E layer and earth surface reflection that is local to the target. For convenience of analysis and description, we use, in this paper, the simplified flat-earth ionosphere model, as depicted in Figure 2. The approach presented for the flat-earth model can nevertheless be implemented in an actual propagation environment after the spheric earth model is properly considered. In the flat-earth model, the reflected propagation paths can be equivalently considered as straight lines to their mirrored positions, where the top line corresponds to the micro-multipath (reflected at the ionosphere and the earth surface), and the second line from the top corresponds to the direct path (only reflected at the ionosphere). Assume that in addition to the target motion in the range direction, which generates a nominal Doppler signature, the target ascends in altitude. This occurs during the target’s departure and landing, as well as in its flying course. In this case, the direct path becomes longer, while the multipath becomes shorter. These paths behave conversely when the target descends. As such, changes in the target altitude will alter the distance of both direct path and multipath, generating Doppler variations with opposite signs around the nominal Doppler signature . These propagation paths of the emitted/received signals associate themselves with different non-linear time-frequency trajectories, each corresponding to a Doppler signature of the target along a propagation path. 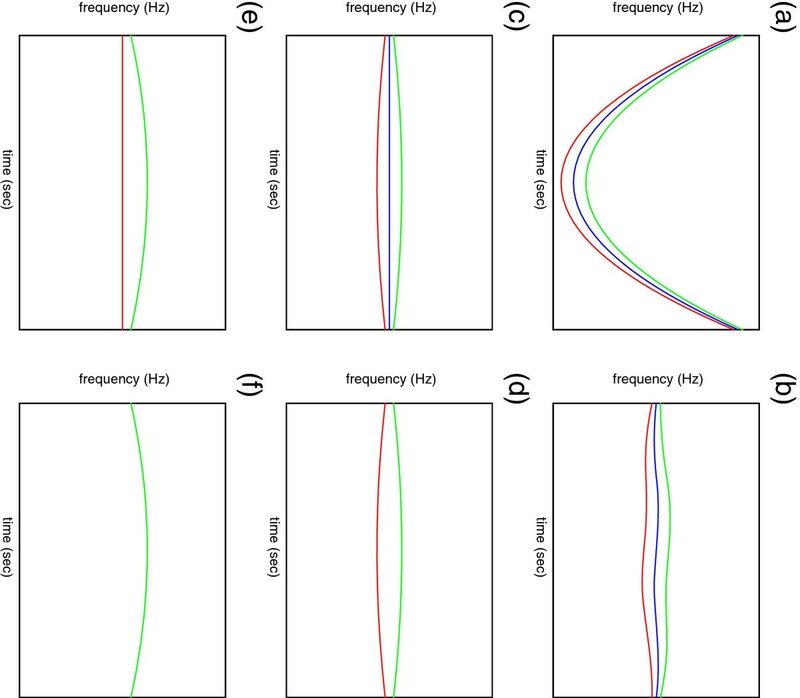 For maneuvering targets, high-resolution time-frequency analyses have been shown to be effective in resolving the multicomponent Doppler signatures, and thus revealing rich and important information about the relative target altitude [9, 10]. 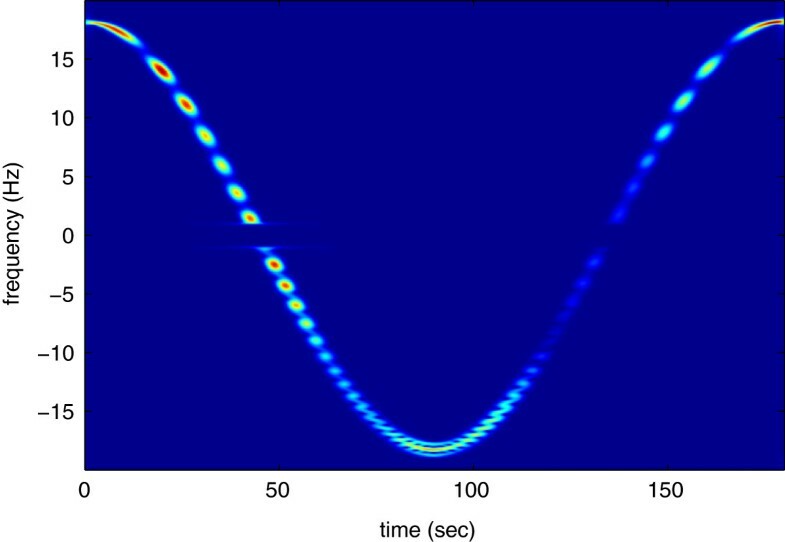 Recently, new approaches for accurate parametric estimations of time-varying multicomponent signals with closely separated Doppler signatures encountered in OTHR systems have been developed and have yielded high accuracy estimation of the relative target altitude [11, 12]. We maintain, however, that the estimation of the actual instantaneous target altitude has not been considered within the non-stationary signal analysis framework. In this paper, we develop a robust altitude estimation technique for maneuvering targets in an MIMO radar environment. Specifically, we focus on the array apertures in the range direction that allow for spatial processing in the elevation dimension. The proposed technique is based on recent advances in non-stationary signal analyses for instantaneous multicomponent Doppler signature estimations. Because Doppler information alone does not provide sufficient information of the absolute target altitude as well as the elevation maneuvering direction (ascending or descending), the target positions are estimated using the extended Kalman filer that exploits different hypotheses of the initial conditions. We then utilize the maximum a-posteriori (MAP) criterion to estimate the initial target altitude and the maneuvering direction. Reliable target altitude estimation is enabled using the initial estimate and the knowledge guided by the time-varying Doppler signature of each individual multipath. The following notations are used in this paper. A lower (upper) case bold letter denotes a vector (matrix). E [ · ] represents the statistical mean operation. (·)∗, (·) T , and (·) H respectively denote complex conjugation, transpose, and conjugate transpose (Hermitian) operations. a ̇ denotes the derivative of a with respect to time. I N expresses the N×N identity matrix. In addition, R denotes the complete set of real scalars, whereas ℂ N × M denotes the complete set of N×M complex entries. x ~ k = [ x k z k x ̇ k Ż k ] T .
Correspondingly, only the array apertures that lie in the range direction are considered, and the cross-range array apertures are ignored. As such, both transmit and receive arrays are considered to be linear, and their apertures extend along the x-axis. Due to the presence of micro-multipath propagation, the combination of the direct path and the multipath in both forward and return links yields the following four combinations of the two-way propagation: path I (l 1:l 1), path II (l 2:l 2), path III (l 1:l 2), and path IV(l 2:l 1). Among them, paths III and IV yield virtually identical two-way slant range. To further describe the advantages of exploiting micro-multipath information, we can represent the multipath propagation in an alternative view, as shown in Figure 3. The micro-multipaths result in two sets of virtual sensors that are respectively located on the top and bottom in this figure. The very large separation of these virtual sensors achieves a large virtual array aperture in the elevation dimension and thus permits accurate target altitude estimations. Extended array aperture due to micro-multipath propagation. Consider a monostatic MIMO radar system consisting of N t closely spaced transmit antennas and N r closely spaced receive antennas. Denote S ∈ ℂ N t × T as the narrowband waveform matrix which contains orthogonal waveforms to be transmitted from the N t antennas over a pulse repetition period of T fast-time samples. We assume that the waveform orthogonality is achieved in the fast-time domain, i.e., by denoting s i as the i th row of matrix S, s i and s m are orthogonal for any i≠m with different delays, and s i is orthogonal to its delayed versions. We also assume that s i has a unit norm, i.e., S S H = I N t .
where θ i , k [ D ] is the elevation angle of departure of the i th path. To simplify processing, we assume that the clutter is sufficiently removed through, e.g., notch filtering of the low-frequency components around the direct current (DC) region. As such, w m,k in (2) at the m th receive element can be considered as additive noise, which is independent and identically distributed (i.i.d.) white complex Gaussian C N ( 0 , σ n 2 ) and is independent of each other and of the target returns. θ 1 , k [ D ] = θ 1 , k [ A ] = θ 1 , k = tan − 1 2 H − z k x k .
θ 2 , k [ D ] = θ 2 , k [ A ] = θ 2 , k = tan − 1 2 H + z k x k .
For path III, the elevation angle of the departure path is θ 3 , k [ D ] = θ 1 , k and that of the return path is θ 3 , k [ A ] = θ 2 , k . For path IV, the elevation angles corresponding to the departure and return paths are θ 4 , k [ D ] = θ 2 , k and θ 4 , k [ A ] = θ 1 , k , respectively. where w m , n , k = w m , k s n H .
r k = [ r 1 , 1 , k , ... , r N t , N r , k ] T = A k ρ k + w k .
u T , 1 = u T , 3 = 1 , u T , 2 = u T , 4 = 2 , u R , 1 = u R , 4 = 1 , u R , 2 = u R , 3 = 2 .
l 1 , k = x k 2 + ( 2 H − z k ) 2 , l 2 , k = x k 2 + ( 2 H + z k ) 2 .
f ave , k = − 1 λ ( l ̇ 1 , k + l ̇ 2 , k ) , f diff , k = 1 λ | l ̇ 1 , k − l ̇ 2 , k | . l 1 , k ≈ x k + 2 H 2 − 2 H z k x k , l 2 , k ≈ x k + 2 H 2 + 2 H z k x k .
where K k = 1 − 2 H 2 / x k 2 . From the above discussion, it is evident that, while the dominant Doppler component f ave , k = 2 K k x ̇ k / λ is shared by all the four paths and reveals the target velocity in the range direction, the small Doppler difference between the paths, f diff , k = 4 H Ż k / ( x k λ ) , is a function of Ż k . Effective time-frequency analysis allows separation of the multicomponent Doppler signatures based on the Doppler frequency difference . 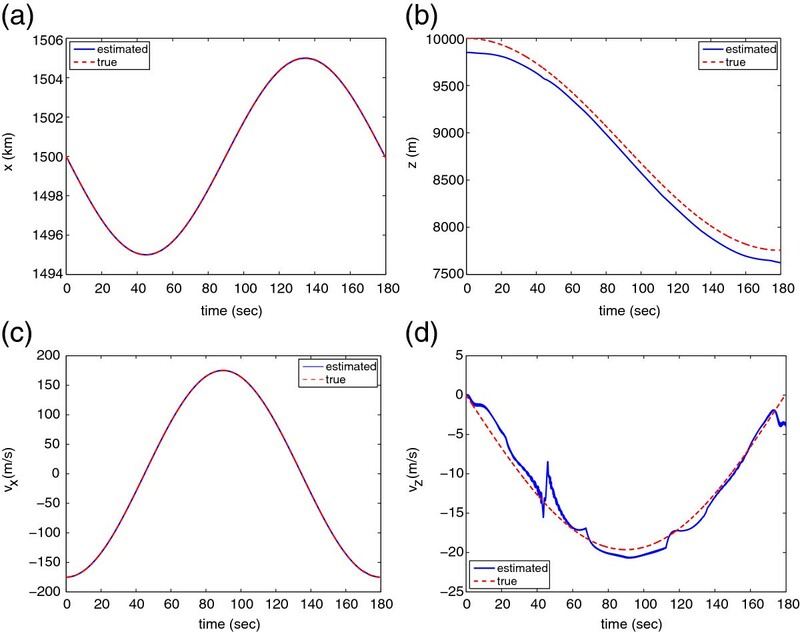 In this paper, the resolved Doppler signatures are used for improved target altitude tracking. In practice, there is ambiguity in the sign of the estimated Doppler difference, i.e., the Doppler frequency difference f diff,k which by itself does not reveal whether a target is ascending and descending. This ambiguity will be considered and resolved in the target tracking process. Similar to many other narrowband radar systems, an OTHR system heavily relies on Doppler analysis to separate targets from clutter and to reveal many important information. Because of the low SNR, OTHR systems often utilize a long coherent integration time (CIT) to achieve a high processing gain. The use of chirplet transform allows a longer CIT for weak target detection when the target returns can be modeled as linear frequency modulated signals . 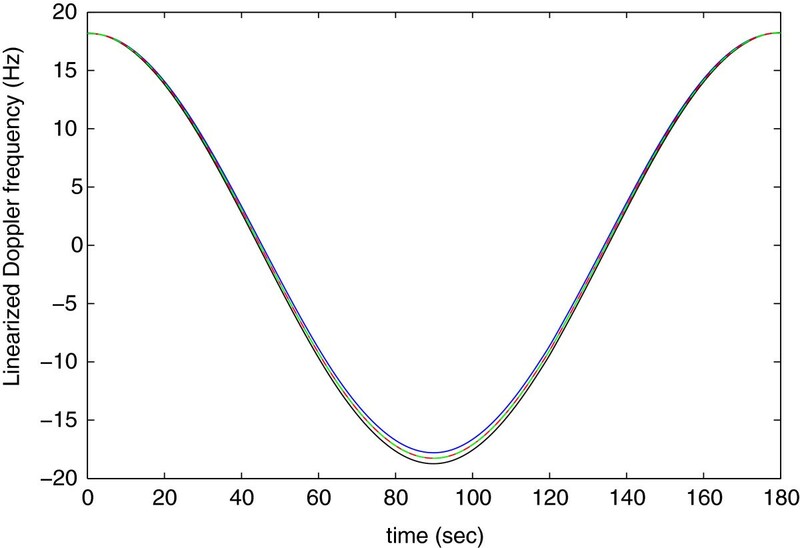 In this paper, we use the signal stationarization technique to achieve further enhancement of non-stationary signals that demonstrate high-order time-varying characteristics [10, 11]. In the following, the instantaneous frequency (IF) estimation and signal stationarization techniques are briefly summarized. 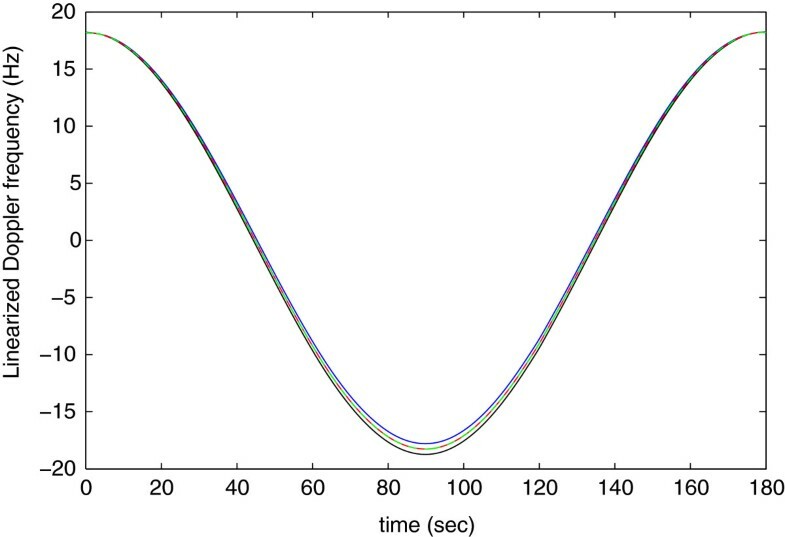 The proposed technique is based on the local analysis of time, frequency, and phase coherence, and uses this information to merge local components in order to estimate the global time-frequency structures characterizing the signal. The primary challenges of this problem lie in the difficulty of separating and resolving the multicomponent returns that are very close in their time-varying Doppler signatures as well as their spatial signatures. We use a two-step procedure for an improved IF estimation, i.e., coarse signal stationarization and fine IF estimations. where R is the expected covariance matrix of r k , i.e., R = E k [ r k r k H ] . In practice, R is obtained through sample averaging. The next step is to obtain the IF estimates of the time-varying Doppler signatures from the combined signal r ~ k . The known information that the three distinct Doppler signatures are closely separated allows us to stationarize all the Doppler components with the IF estimate of a single signal component. The process is illustrated in Figure 4. Denote the resulting Doppler signature estimate of one component (which can be any of the three distinct components) as f D,coarse and the corresponding phase signature as ψ coarse. The procedure of estimating the IF estimation of a single-component signal is summarized in the Appendix. By multiplying r ~ k by exp(−j ψ coarse), all the three components r ~ k , coarse = r ~ k exp ( − j ψ coarse ) become approximately stationarized and are located in the low frequency region (Figure 4b). With the waveform being more stationary, the IF estimation procedure can be performed again to obtain finer IF and phase estimates (denoted as f D,fine and ψ fine, respectively). By multiplying r ~ k , coarse by exp(−j ψ fine), improved signal stationarization is achieved (Figure 4c). As a result, one of the signal components is stationarized with a high accuracy, i.e., it approximately becomes a DC component, whereas the Doppler signatures of the other two components have non-zero frequencies. The original Doppler signature of the stationarized component can be determined from the IF estimates used in the stationarization, i.e., f D,coarse+f D,fine. Illustration of the IF estimation process. (a) Original Doppler signature, (b) after coarse stationarization, (c) Stationarization with accurate Doppler estimate, (d) after removal of the stationarized component, (e) stationarized with one of the remaining components, and (f) after removal of the stationarized component. Now, we can filter out the stationarized signal component by removing the DC component, yielding the two remaining components (Figure 4d). We then repeat the IF estimation and stationarization process to obtain the IF estimate of the second signal (Figure 4e) and remove the stationarized signal component to estimate the last signal component (Figure 4f). After all the three components are estimated, they are sorted such that f D,1,k and f D,2,k have the highest and the lowest values, respectively, whereas f D,1,k takes value between them. With the separation of the IF signatures, each multipath signal component can be separated as well. In particular, we are interested in signal components corresponding to paths I and II, which allow us to analyze the target maneuvering, in terms of the Doppler frequency and elevation angle, for each individual path. where P denotes the filtering processing. In this paper, the filtering is implemented in the frequency domain by masking the Fourier transform coefficients, i.e., P ( · ) = F − 1 M F ( · ) , where F denotes the Fourier transform, and M is a proper binary mask with ones in the passband around the DC component. By eliminating the effect of interactions between different paths, r k [ i ] enables better association of the measurement data with the target maneuvering. Naturally, the array data vector, r k , is considered as the observation vector. Target geolocation based on extended Kalman filtering exploiting the array data vector, however, does not yield satisfactory target altitude information. To take advantage of the resolved estimates of the Doppler signatures, the following steps are performed to yield high-accuracy target altitude estimates. The average and difference Doppler signatures, denoted as a vector f D,k =[f ave,k ,f diff,k ] T , are used as additional observations. The incorporation of the instantaneous Doppler estimates generally provides good estimation of relative target altitude, but the instantaneous target altitude is still very sensitive to the initial target position vector x ~ 0 , particularly the initial altitude z 0, assumed in time k=0. In addition, as we discussed before, the Doppler difference has an ambiguity in the target direction of its elevation maneuvering. To overcome these problems, we use multiple hypotheses of the initial target position and vertical orientation and find the best solution that maximizes the MAP criterion. Note that due to the low SNR involved in this problem, the a-posteriori probability offered by the measured data at each time instant is not reliable enough to provide meaningful information. Rather, we use the a-posteriori probability of all the observed time instants so that a reliable MAP metric is achieved. In the following, we introduce the target state model, and the estimation for instantaneous target estimation, assuming an initial target position, is described. The MAP-based estimation of the initial target altitude and the elevation orientation are then addressed. x k = [ x ~ k T σ k T ] T .
and Δ is the pulse repetition interval. q ( x k | x k − 1 ) ∼ N ( F x k − 1 , Q ) . In this step, the target altitude will be estimated with hypotheses of the initial target position, x 0, and the direction of the target elevation velocity, i.e., ascending or descending. The ambiguities will be solved in the following subsection. f ave , k = − 1 λ ( l ̇ 1 , k + l ̇ 2 , k ) = △ g 1 ( x k ) , f diff , k = − 1 λ ( l ̇ 2 , k − l ̇ 1 , k ) = △ − g 2 ( x k ) . h 4 , k ( x k ) = − 1 λ 2 x k x ̇ k − 2 ( 2 H − z k ) Ż k x k 2 + ( 2 H − z k ) 2 − 2 x k x ̇ k + 2 ( 2 H + z k ) Ż k x k 2 + ( 2 H + z k ) 2 ∈ R , target ascends , 1 λ 2 x k x ̇ k − 2 ( 2 H − z k ) Ż k x k 2 + ( 2 H − z k ) 2 − 2 x k x ̇ k + 2 ( 2 H + z k ) Ż k x k 2 + ( 2 H + z k ) 2 ∈ R , target descends. We attempt to solve the aforementioned two problems, i.e., the initial target altitude estimation and target elevation movement direction (ascending or descending), by making multiple hypotheses of the initial target position and vertical orientation and find the best solution that maximizes the MAP criterion. ln f ( Z | X [ x 0 , ν ] ) = − 1 2 ∑ k = 1 K ( z k − h k ( x k [ x 0 , ν ] ) ) H R n − 1 × ( z k − h k ( x k [ x 0 , ν ] ) ) . Our objective is to find x 0 and ν such that ln f ( X [ x 0 , ν ] | Z ) is maximized. [ x ̂ 0 , ν ̂ ] = arg max x 0 , ν [ ln f ( Z | X [ x 0 , ν ] ) + ln f ( X [ x 0 , ν ] ) ] . h ( t ) = h ( 0 ) − v c , max T 0 π 1 − cos πt T 0 . To account for the Doppler shift due to ionosphere, we use a general Gaussian scatter model proposed in the ITU  for the simulation of HF ionospheric channels. This model is based on Watterson’s channel model . The Matlab code and parameters provided in  are used to generate the propagation channel coefficients, σ i , where i=1,2, and 3. The correlation between σ 3 and the other two coefficients is assumed to be 0.64 and that between σ 1 and σ 2 is assumed to be 0.49. The yielding Doppler signatures are depicted in Figure 5. Three distinct Doppler signatures due to micro-multipath propagation. We assume an OTHR system that uses 2-D arrays in the cross-range and range directions. For target altitude estimation purpose, we are only concerned with the array aperture in the range direction. As such, by assuming that the signals across the cross-range dimension are coherently combined, we consider a small-size MIMO array that consists of six transmit antennas and ten receive antennas. Both arrays are linear, and the antennas are extended in the range direction. The minimum redundant array configurations [19, 20] are used at the transmit and receive arrays, with the unit separation being one wavelength. The transmit and receive arrays are separated by a 100-km cross-range distance. The typical ground range is in the order of thousands of kilometers. Therefore, the radar can be considered monostatic. In particular, the elevation angles are virtually identical for both arrays. Notice that because of the multipath propagation, the co-array equivalence between the transmit and receive arrays is only achieved at each resolved path (i.e., path I and path II). Figure 6 shows the spectrogram of the Capon beamformer output ( r ~ k ), where the input SNR at each antenna is -10 dB, and a Hamming window of length 255 is applied when performing the short-time Fourier transform. Signals falling in between -1 and 1 Hz are filtered out for clutter removal. Figure 7a shows the estimated IF signatures of the three Doppler components. Figure 7b shows the estimation frequency error for the three components. The estimation error is in the order of a few hundredth of a hertz. It is relatively larger in the two edges due to the lack of paring segment and around the two instants where the data is suppressed due to clutter removal. Spectrogram of the received signal at the Capon beamformer output. Doppler frequency estimation results. (a) Estimated Doppler frequency. (b) Estimated Doppler error. The estimated target positions are depicted in Figure 8. In determining the target initial states, we assume that the initial target altitude is uniformly distributed between 5,000 and 15,000 m, and a step size of 50 m is used. Because the initial target altitude and the elevation motion direction are coupled, these two variables are jointly determined. As a result, the radar system can correctly identify that the target flies in a descending mode. In 100 Monte Carlo trials with different noise realizations, the motion directions are all correctly identified. The average value of the estimated initial altitude is 9,825 m, and the standard deviation is 219 m.
Tracking performance. (a) Target ground range. (b) Target altitude. (c) Range-direction velocity. (d) Elevation velocity. Figure 8a shows the ground range estimate (x k ), whereas the corresponding range velocity ( x ̇ k ) is plotted in Figure 8c. The initial target altitude estimate in this example is 9,850 m. Very high accuracy estimation is achieved for both parameters largely because of the small Doppler estimation error relative to the overall Doppler frequencies. Figure 8b shows the target altitude (z k ), and the corresponding elevation velocity ( Ż k ) is shown in Figure 8d. Overall, good instantaneous target altitude estimation is achieved. 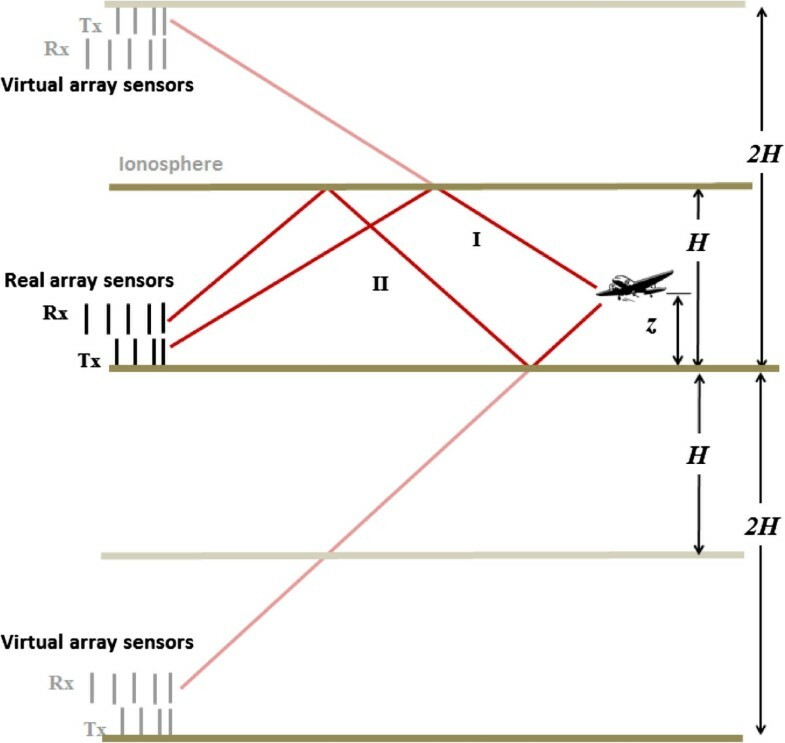 In this paper, we have developed a novel technique that provides an accurate estimation of the instantaneous altitude of a maneuvering target in an over-the-horizon radar system. The proposed method utilizes the micro-multipath Doppler signatures due to earth surface reflection, which are analyzed and separated by advanced non-stationary signal analysis techniques. Accurate estimation of the instantaneous frequency of such Doppler signatures allows high-quality target trajectory estimation through an extended Kalman filter with hypotheses of target elevation motion direction and initial target altitude. These hypotheses are then estimated based on the maximum a-posteriori criterion. Simulation results verified the high-accuracy target position estimation results. mlHAF [ s ( t ) ; ω , τ M ] = ∫ 0 T mlHIM [ s ( t ) , τ M ] exp ( − jωt ) dt. arg max ω | mlHAF [ s ( t ) ; ω , τ M ] | = M ! τ M − 1 a M .
Therefore, an estimate of a M can be obtained from the peak position of |mlHAF[s(t);ω,τ M ]|. Then, the M th-order polynomial phase component can be removed by multiplying the original signal s(t) with the conjugate of the estimated M th order polynomial phase signal as s [ M − 1 ] ( t ) = s ( t ) exp ( − j â M t M ) , where â M denote the estimate of a M . This procedure can be repeated by estimating a m−1 from s [m−1](t) for m=M,...,2.
where t 0 [ w ] = ( w − 1 ) T / 2 is the starting time of segment w, and T is assumed to be even. The polynomial phase coefficients, a m [ w ] , can be determined using the procedure described above. is a triangular window function that uses a higher weight towards the center of each segment, and t 0 [ w ] = ( w − 1 ) T is the start time of the w th segment. Note that h(τ) takes a value of one in edge segments when a pairing counterpart is not available. The work of Y. D. Zhang and M. G. Amin was supported in part by a subcontract with Dynetics, Inc. for the research sponsored by the Air Force Research Laboratory (AFRL) under Contract FA8650-08-D-1303. Y. D. Zhang was also supported in part by the Air Force Office of Scientific Research (AFOSR) through the Air Force Summer Faculty Fellowship Program under contract number FA9550-09-C-0114.